عربی, سیدهادی, زاهدی وفا, محمدهادی, رضائی, محمدجواد, موحدی بکنظر, مهدی. (1395). نظریه بازی‏ها به مثابه ابزاری برای فلسفه اخلاق؛ تبیینی تاریخی و تحلیلی انتقادی. اقتصاد اسلامی, 16(63), 91-116. سیدهادی عربی; محمدهادی زاهدی وفا; محمدجواد رضائی; مهدی موحدی بکنظر. "نظریه بازی‏ها به مثابه ابزاری برای فلسفه اخلاق؛ تبیینی تاریخی و تحلیلی انتقادی". 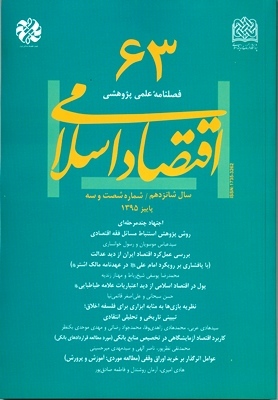 اقتصاد اسلامی, 16, 63, 1395, 91-116. عربی, سیدهادی, زاهدی وفا, محمدهادی, رضائی, محمدجواد, موحدی بکنظر, مهدی. (1395). 'نظریه بازی‏ها به مثابه ابزاری برای فلسفه اخلاق؛ تبیینی تاریخی و تحلیلی انتقادی', اقتصاد اسلامی, 16(63), pp. 91-116. عربی, سیدهادی, زاهدی وفا, محمدهادی, رضائی, محمدجواد, موحدی بکنظر, مهدی. نظریه بازی‏ها به مثابه ابزاری برای فلسفه اخلاق؛ تبیینی تاریخی و تحلیلی انتقادی. اقتصاد اسلامی, 1395; 16(63): 91-116. فلسفه اخلاق، پژوهشی درباره درستی، نادرستی، روایی یا ناروایی اعمال یا تحقیق درباره استدلال‏های ورای باورهای اخلاقی ماست. یکی از عرصه‏های مهم فراخوانی باورهای اخلاقی یا درک عمل درست یا نادرست، حوزه رفتارهای تعاملی و متقابل انسان‏هاست؛ ازاین‌رو منطقی به نظر می‏آید که نظریه بازی‏ها، به‌عنوان مطالعه فرایند و برایند تعامل های افراد، ظرفیت برخی کاوش‏های فلسفی و اخلاقی را داشته باشد. مقاله پیش ‌رو در پی آن است که نخست اثرگذاری برخی ایده‏ها و مدل‏های نظریه بازی‏ها بر برخی ایده‏ها و نظریهها در حوزه فلسفه اخلاق و عدالت‏پژوهی را بررسی کرده؛ سپس استواری اعتبار و کارامدی چنین اثرهایی را تحلیل انتقادی کند. شیوه پژوهش در قسمت نخست مبتنی بر مطالعه‌های تاریخی از 1940م تاکنون است. ارزیابی انتقادی ارائه‌شده نیز به شکل تحلیل نظری است. یافته‌های پژوهش بیان‌گر آن است که برخی نوآوری‏های صورت‌گرفته در نظریه بازی‏ها بر برخی ایده‏ها و نظریه‌ها در حوزه فلسفه اخلاق و عدالت‏پژوهی اثرگذار بوده است. ارزیابی انتقادی چارچوب تحلیلی ایده‏ها و نظریه‌های مبتنی بر رهیافت نظریه بازی‏ها، نشان‏دهنده کاستی‏ها و دشواری‏هایی در راه بهره‌گیری از نظریه بازی‏ها به‌عنوان ابزاری برای فلسفه اخلاق است. Moral philosophy is an inquiry about the correctness/wrongness and permissibility/impermissibility of actions, or an inquiry about the arguments beyond our moral beliefs. One of the important areas of recalling moral beliefs or understanding right and wrong actions is the realm of humans’ interactive behaviors. So it seems plausible that “game theory”, as the study of the process and outcome of individuals’ interactions, should have the capacity to be philosophically and ethically investigated. This paper tries to, first, investigate the effect of “some ideas and models in game theory” on “some ideas and theories in moral philosophy and justice studies”, and then critically analyze the validity and fruitfulness of such effects. Research method in the first part is based on the historical studies performed since 1940. The presented critical evaluation is in the form of a theoretical analysis. The findings suggest that some innovations in the game theory have been effective on some ideas and theories in moral philosophy and justice studies. The critical examination of the analytical framework of ideas and theories based on game theory approach shows the shortcomings and difficulties in taking advantage of game theory as a tool for moral philosophy. پالمر، مایکل؛ مسائل اخلاقی: متن آموزشی فلسفه اخلاق؛ تهران: سازمان مطالعه و تدوین کتب علوم انسانی دانشگاه‏ها و پژوهشگاه علوم و فرهنگ اسلامی، 1388. پیک حرفه، شیرزاد؛ «سودای سربالا: سقف اخلاق بر ستون سود»؛ پژوهش‌های فلسفی، س5، ش9، 1390. زاهدی‌وفا، محمدهادی و محمدجواد رضایی؛ «نظریه بازی‌های تکاملی و ارزیابی مجدد از ایده «پیشرفت در نظریه بازی‌ها»؛ بررسی از نظر روش‌شناسی علم اقتصاد»؛ فلسفه علم، س5، ش2، 1394. عربی، سیدهادی؛ «از اقتصاد اثباتی تا اقتصاد هنجاری: بنیان‏های فلسفی و ارزشی اقتصاد رفاه»؛ روش‌شناسی علوم انسانی، س14، ش57، 1387. مصباح ‌یزدی، محمدتقی؛ نقد و بررسی مکاتب اخلاقی؛ قم: مؤسسه آموزشی و پژوهشی امام خمینی;، 1384. Aumann, R. J.; “Game Theory”; in The New Palgrave Dictionary of Economics, ed. by Steven N. Durlauf and Lawrence E. Blume, Basingstoke: Palgrave Macmillan, 2008. Binmore, Kenneth G.; Playing fair: Game Theory and the Social Contract; Cambridge, Mass., London: The MIT Press, 1994. ——; Just playing: Game Theory and Social Contract; Cambridge, Mass., London: MIT Press, 1998. —— ; Natural justice; New York, Oxford: Oxford University Press, 2005. ——; Game theory: A very short introduction; New York: Oxford University Press, 2007a. ——; Playing for Real: A text on game theory; Oxford: Oxford University Press, 2007b. Braithwaite, Richard B.; Theory of games as a tool for the moral philosopher: An inaugural lecture delivered in Cambridge on 2 December 1954; Cambridge: Cambridge University Press, 1955. Curry, Oliver S.; “Morality as Cooperation: A Problem-Centred Approach”; in The evolution of morality; ed. by Todd K. Shackelford and Ranald D. Hansen; Cham, Switzerland: Springer, Evolutionary psychology, 2016. Dixit, Avinash K., and Susan Skeath; Games of strategy; 2nd ed; New York, London: W. W. Norton & Co, 2004. Gauthier, David P; Morals by agreement; Oxford: Clarendon, 1986. ——; “Uniting separate persons”, in Rationality, justice and the social contract: Themes from Morals by agreement; ed. by David P. Gauthier and Robert Sugde; New York, London: Harvester Wheatsheaf, 1993. Gibbons, Robert; A primer in game theory; Harvester Wheatsheaf, 1992. Harsanyi, John C.; “Can the Maximin Principle Serve as a Basis for Morality? A Critique of John Rawls's Theory”; The American Political Science Review, 69.2, http://www.jstor.org/stable/1959090, 1975. ——; Rational behavior and bargaining equilibrium in games and social situations; 1st ed; New York: Cambridge University Press, Cambridge paperback library, 2008 . Hausman, Daniel M., and Michael S. McPherson; Economic analysis, moral philosophy, and public policy; 2nd ed; New York: Cambridge University Press, 2006. Hoffman, Moshe, Erez Yoeli, and Carlos D. Navarrete; “Game Theory and Morality”, in The Evolution of Morality; ed. by K. T. Shackelford and D. R. Hansen; Cham: Springer International Publishing, 2016. Kalai, Ehud, and Meir Smorodinsky; ”Other Solutions to Nash's Bargaining Problem”, Econometrica, 43.3, 1975. Lehtinen, A., and J. Kuorikoski; “Unrealistic Assumptions in Rational Choice Theory”; Philosophy of the Social Sciences, 37.2, 2007. Nash, John F; “The Bargaining Problem”; Econometrica, 18.2, http://www.jstor.org/stable/1907266 ,1950. Neumann, John von, and Oskar Morgenstern; Theory of games and economic behavior; 60th ed; Princeton: Princeton University Press, Princeton classic editions; 2007. Pettit, P.; “Virtus normativa: Rational choice perspectives”; Ethics, 1990. Rasmusen, Eric; Games and Information: Reputation and Repeated Games with Symmetric Information; http://www.rasmusen.org/GI/chapters/chap05_repeated.pdf, 2005. Rubinstein, Ariel; “Comments on the Interpretation of Game Theory”; Econometrica, 59.4, http://www.jstor.org/stable/2938166, 1991. Schelling, Thomas C.; “Game Theory and the Study of Ethical Systems”; The Journal of Conflict Resolution, 12.1: 34–44 http://www.jstor.org/stable/172812, 1968. Skyrms, Brian; Evolution of the social contract;Cambridge: Cambridge University Press. 1996. ——; The Stag Hunt and the Evolution of Social Structure; Cambridge: Cambridge University Press, 2004. Smith, John M.; ‘Game theory and the evolution of fighting’, in On evolution; ed. by John M. Smith; Edinburgh: Edinburgh University Press, 1972. Smith, John M., and G. R. Price; “The Logic of Animal Conflic”; Nature, 246.5427, 1973. Sugden, Robert; “Spontaneous Orde”; The Journal of Economic Perspectives, 3.4, 1989. ——; The economics of rights, co-operation, and welfare; 2nd ed; New York: Palgrave Macmillan, 2005 . Verbeek, B.; “Rational Choice Virtues”; Ethical theory and moral practice, 13(5), 2010.